Up to 70% of students from other European Union countries are failing to repay student loans they took out while at UK universities, the BBC has learnt. The Student Loans Company says 2,240 students should have begun repayments but 1,580 are not accounted for. A Spanish student said she had heard nothing five years after graduating. The government says the SLC is doing what it can to track people down. Take-up of the entitlement is growing fast, with 46,000 now having borrowed £130m. Students from EU countries have been eligible for low interest loans from the British taxpayer to pay for their tuition fees since 2006. EU students are entitled to the same allowances as those in the countries in which they study. Most of those involved are still at university so are not due to begin repaying loans until the year after graduation or withdrawal from university, and once they are earning more than £15,000. Lower salary levels apply in most other European countries. SLC figures show that 2,240 students were due to begin repayment in 2007 and 2008. But 59% of those due to start paying back their loans in 2007 did not do so, while last year that number rose to 70%. According to the SLC records those students, some 1,580 of them, are unaccounted for. The loans for both years were worth about £3.8m. Experts believe this is a warning sign of much larger repayment problems to come when greater numbers of EU students start graduating. David Willetts MP, Shadow Secretary of State for Innovation, Universities and Skills believes the SLC is not doing enough to track students down once they leave the country. "It's very important that the Student Loans Company is as energetic in collecting debt built up by students across the continent of Europe as they must be in collecting debts from students in Britain," he said. "The evidence that we're getting already shows that the Student Loans Company is being shockingly ineffective in collecting money that's owed." 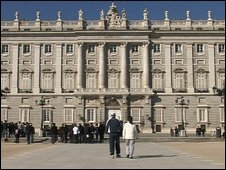 The BBC found one Spanish former student who graduated from a university in England almost five years ago. Now living in her home country, she said she had been surprised that she had had no communication from the SLC about repaying her loan since graduating. She asked not to have her name published. "If you don't have anyone reminding you that you owe them money, and that you have to pay, you can forget about it," she said. "You don't live there and you have other priorities. It's quite easy just to forget. "If you owe money to the bank but then you don't hear from them, then you just don't worry. It's just human nature." This graduate owes £10,000 and said that in the end she became concerned that the size of her loan was increasing because of interest, so she contacted the SLC herself. She has just begun repaying the loan voluntarily. "It is a loan, and when you sign a contract you have to pay it back. It's my responsibility to do so," she said. However she added that she knew of several other students who were not intending to pay back their loans until they heard from the SLC. Students applying for loans always have to provide a permanent address, such as their parents' home address. But a spokesman for the SLC said it did not routinely write to parents' addresses because it might be a breach of data protection rules. Collecting debts in the UK is much simpler than overseas. Loans are recovered automatically through the tax system as soon as a former student is earning more than £15,000. Outside the country though there is no repayment mechanism. The SLC has to rely on students informing it of their earnings and making their own payment arrangements. British ex-students living overseas are also expected to make their own arrangements, and there is no suggestion that EU students are any more likely to avoid repaying their debts than UK students. The BBC asked the SLC for figures relating to British students' unpaid debts but it was unable to provide the information. The government insisted that the SLC was doing everything it could to trace students who moved overseas. It also claimed that many of the students potentially due to repay their loans might not yet be required to do so because their earnings were not high enough. The Higher Education Minister, David Lammy, said he took the issue seriously. "I think it is wrong to say that there are vast numbers of students not in touch with the Student Loans Company," he said. "Of course there are a percentage of young people that take out loans, and then in the early years of their employment don't repay those loans. But I hope you are not suggesting that EU students are more dishonest than UK students, because that I would not accept." The SLC has not taken legal action against any EU students for non-repayment of loans, although it says it is considering taking nine former students to court. They are understood to be from France, Spain, Poland and Greece. Mr Lammy said that would be a last resort. "None of us are in the business of trying to drive 20-year-olds through the courts," he said. "All of us seek to remind young people of their responsibilities and that applies both to UK and EU citizens."